While it has its slow moments, a first viewing will be anything but boring if you can decide to care about the characters. The thing I find all too often these days is that people won’t watch a movie for the characters, they’ll just watch it for the spectacle. The film’s pacing is excellent, and it harkens back to spy thrillers of the Robert Redford area – Redford himself appearing as a S.H.I.E.L.D. government administrator as if to validate the tone of the movie. There are some moments of real tension mixed in as well as quite the epic building-smashing finale, although you actually care about the destruction a good bit more than you did in The Avengers. What you have here is a well-directed, well-crafted thriller that happens to be taking place in a superhero world. And since superheroes are “super” it does add certain heights to this kind of movie that you wouldn’t have if it was set in the real world. CRAFTSMANSHIP: As with all the Marvel films, craftsmanship of the film is very sufficient and quality. The music, production design and sound design are all professional and quality. But what really stands out is the directing. The Russo brothers have crafted a film here that has real moments; of excitement, of tension, of despair – here is the superhero film that actually flows like an artful movie. Their unique take on this superhero escapade turns it into a white elephant among the genre, a superhero film that tackles topics of government control, civil liberty and grey morality in a modern world where things are no longer clearly black and white. Another high point of the film is its choreography. The Winter Soldier features one of the best, if not the best fight scenes in the whole Marvel franchise – a Jason Bourne style fight between two super humans that really packs a punch. We get to see Captain America put to the test fighting the Winter Soldier, someone who is an equal to him in strength and speed. But Cap is resourceful, like Bourne, and manages to hold his own and push back, making an important discovery: the Winter Soldier is actually Bucky Barnes, Cap’s childhood friend and comrade from WW2. It is a very emotionally compromising discovery for Cap. CINEMATOGRAPHY: Another interesting take on the superhero genre outfits this movie with a large amount of handheld camerawork. It adds to the realistic world setting and tone of the film, getting us right up close and personal with the characters and events. But of course this isn’t a Nolan film, so while the camerawork is all above par and well done, with plenty of visual spectacle, don’t go looking for anything particularly artistic in a superhero film. PERFORMANCES: Evans and Johansson really bring their A-game and acting chops to this story, adding some serious depth to their characters of Steve Rogers and Natasha Romanoff, and really making them believable. We also get to see their relationship evolve to a solid friendship. There are a few scenes between them that feel perfect – it’s like the comics have finally come to life and are playing out onscreen. The other performances are all adequate and do their job. Samuel L. Jackson delivers another deadpan take on Nick Fury, Robert Redford adds some authenticity to all the scenes he is in, and Emily Van Camp introduces new character Sharon Carter with some attitude and solidity. WRITING: Again in non-traditional superhero style, the script of Winter Soldier hits the right notes, packing a twist and story arc that permanently changed the landscape of the Marvel Cinematic Universe. Some of the dialogue is exceptional, well paced exchanges between the characters carrying the same realistic tone as the whole film. While there are obviously some loopholes, what is presented in the writing and story is a believable, real-world superhero film with events that strongly reflect what is happening in today’s world of drone-strikes, shady government spy agencies and the changing of the Geo-political landscape of the world. The central question put forward in the film is one of the grey morality we encounter in the modern world – is our security worth sacrificing our freedom? It’s a question that Steve Rogers struggles with, and it will get you thinking as well. MUSIC: Again, while superhero films are not exactly a composer’s ideal blank canvas for creating an original score due to their constraints of franchise, existing musical themes, etc. ; the music of Winter Soldier is very fitting to its scenes, with a Hans Zimmer-like repetition and tick that drives the tension of the story. It adds a swell to what’s happening on screen and it helps drive home impact-ful moments of the film. 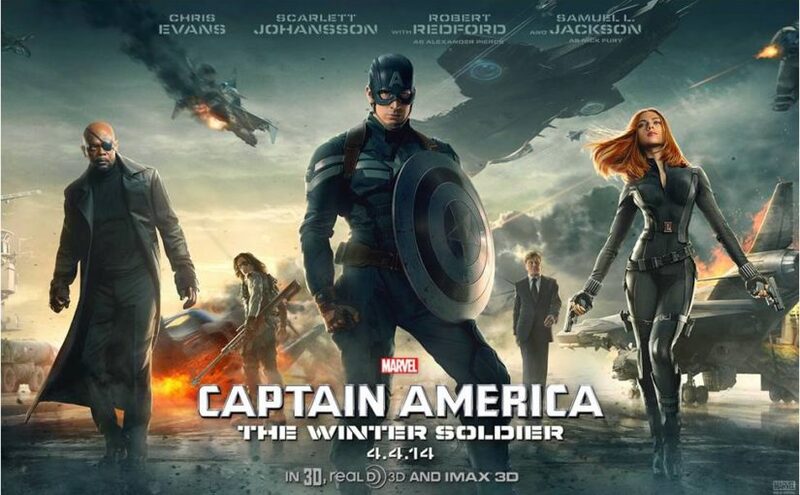 Henry Jackman delivers a solid score – one that you will start to recognize Captain America by. STORY: The story is a breath of fresh air in a time of cookie-cutter plot-lines being recycled through a Hollywood machine. As previously mentioned, the twist packed into The Winter Soldier changes the world of the MCU drastically, and permanently. It’s also a turn that no one saw coming which makes it even harder to believe – and much more dramatic. As the existing world of S.H.I.E.L.D. and the MCU starts to unravel it takes the characters to new extremes, having to figure out what to do in a situation where everything has flipped. While it might not be the most original plot-line or story-line ever, it is very well done, and it’s a solid iteration of the existing spy-thriller genre. The rising action was well balanced, and the climax is solid. The resolution of the film was a perfect setup for future installments and a good step forward in the continuing Marvel franchise. OVERALL REVIEW:Captain America: The Winter Soldier is a solidly good film, delving into new ground for the superhero genre and for the characters within it. It’s well worth a watch even if you don’t usually follow superhero films because it offers a new mix of genres, action and themes that have not really been touched upon before. It delivers some tense, heart-pounding moments, and a few instances of real drama and impact. A very entertaining, well-directed film worth the 2 hour and 16 minute run-time.